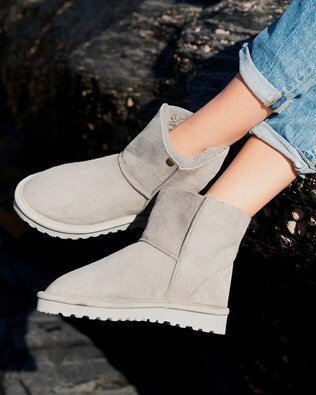 Perfect for walks and weekends by the sea, our ankle length boots are a year-round favourite. Every pair is handmade in Cornwall from the finest British sheepskin, with a lightweight rubber sole. I love these boots, I now have two pairs of shortie, moorland and claret, and one of the aqualamb. So snuggly and comfy and true to size. I find them far comfier than the across the seas competitor ones and more attractive! A very useful addition to my autumn/winter wardrobe. They are comfortable and they look good. Why buy from a pricier and better known competitor? The advice to size down rather than up is sound. I ordered a size 6 rather than my normal 6 1/2 and they fitted well within hours of trying them on.